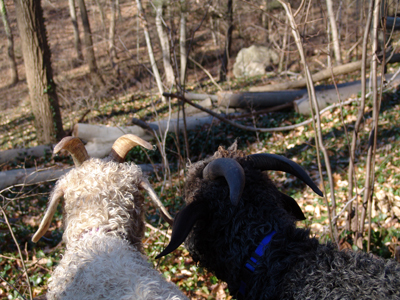 Last week Yvonne Post’s lead goats, Wyeth and Rodin, visited the Scott Arboretum on a reconnaissance mission. As lead goats, Wyeth and Rodin (named for famous artists) are brought to trial new locations and vegetation to see if the entire herd would take to the site and eat the weeds found there. 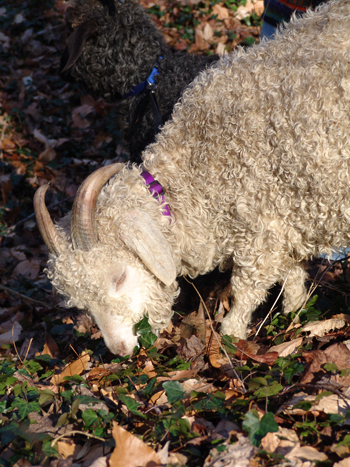 Like many other institutions in the region, the Scott Arboretum is trialing the use of goats to remove invasive and stubborn weeds from the garden. Also called “nature’s weed-eaters”, goats are a sustainable, environment friendly way to treat weed infestations as opposed to chemical treatments. Post’s herd of six wethers, castrated male goats, have already begun removing Canada thistle, Cirsium canadense, at Bartram’s Garden. 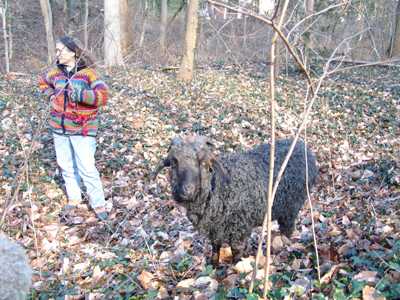 The herd is also hoping to visit Longwood Gardens to help remove garlic mustard, Alliaria officinalis. Post has described how they delight at eating mile-a-minute vine, Polygonum perfoliatum, on her property. Here at the Scott Arboretum, we are working on removing English ivy, Hedera helix. This trail evaluated whether the goats will eat the ivy blanketing the banks of the Crum Woods or whether they would graze on other plant material. We are happy to report that after settling into their new surroundings in the woods, Wyeth and Rodin blissfully chomped away on ivy and fallen leaves. 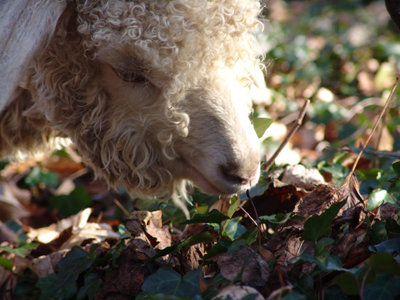 The complete herd of Angora goats will return this January to begin foraging on the ivy in earnest. Goats are more effective at weed removal than other grazers, such as sheep. Goats rip and pull the plants out by the roots when they forage, as compared to sheep who simply graze the tops of the plants, leaving the roots intact. Post recommends having the goats for three consecutive years to see true effect on a weed patch. Goats prefer to feed on different plants at various times of year. As Post explains, “They get bored.” As you can image with ability to eat such a variety of food, you would like to spice up your diet too. They enjoy the young shoots for Canada thistle in the spring, mile-a-minute vine in the summer, and fallen leaves and weedy grasses in the fall. For this reason, the herd will visit the Scott Arboretum in the winter feeding on the smorgasbord of ivy. This way the herd will not be distracted by more choice plants found during warm months and allowing them to focus on controlling our English ivy infestation. of the goats. Thanks so much. I love this and have heard a few places in my area (near Boston) that are trying this. It’s so eco-friendly and the goats are damn cute! Those of us on the Woods Crew at the Arboretum were talking the other day about the goats, and whether they were ever going to help us with the ivy. thank you for providing this wonderful update. I hope that , on one of their visits, we will be able to meet these lovely creatures.